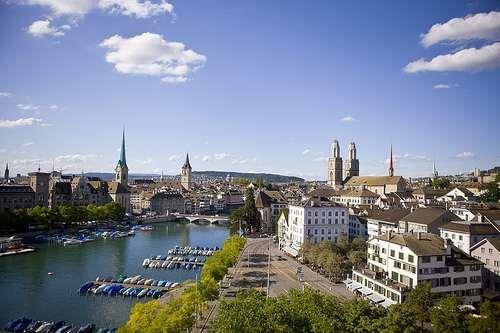 Switzerland is rolling out the red carpet and is primed for hosting large and small groups that want to learn more about the country and the Reformation movement in Switzerland. And with the Luther Decade coming to a conclusion in 2017, faith-based groups are making preparations for tours to coincide with this important religious event. With its captivating religious history, wide choice of accommodations, excellent food, enticing landscapes, diverse cities and languages, and its highly-developed transportation system, Switzerland is the ideal location for a tour, with Zurich and Lucerne two top destinations. Zurich airport, the 12th busiest airport in Europe, has been voted the third best airport in Europe, and handles 25 million people a year. 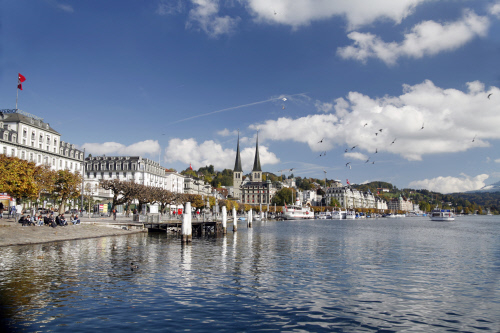 The airport is an ideal place to start your tour, with excellent rail transportation to exciting downtown Zurich where you can walk the famous Bahnhofstrasse, take an excursion on Lake Zurich and see Zurich’s many religious and historical sites. Reformers began teaching the principles of Martin Luther in Switzerland as early as 1523 when Huldrych Zwingli, the most important Swiss reformer, applied Luther’s ideas comprehensively to doctrine and practices. In 1518, Zwingli was appointed people’s priest at the Grossmünster (Great Minster) at Zürich, and in 1520 he secured permission to preach the “true divine scriptures,” with the resulting sermons helping to initiate the important Swiss Reformation of 1522. Already in the 16th century Zurich’s city fathers voted to make Zurich a Protestant town, but two top Zurich religious pilgrimage sights, the Grossmünster Church (built 1100) and the Fraumünster Church (built 1250) were built long before that time. The wood-paneled office at 13 Kirchgasse, where reformer Zwingli studied and wrote his sermons that forever altered Switzerland, is also open to the public. More than 50 museums and 100 art galleries dot the city, and the museum of fine arts, the Kunsthaus Zürich, boasts a significant collection of paintings, sculptures, photographs and videos. The Swiss National Museum – housed in an over-100-year-old building reminiscent of a fairytale castle – contains the country’s most comprehensive collection of exhibits relating to Swiss cultural history. Many fine restaurants and a vibrant shopping district are also among Zurich’s attractions, along with numerous recreational activities such as the close-by Uetliberg Mountain. Just about an hour away from Zurich by train is Lake Lucerne, another attractive Swiss city with important historical religious significance. Lucerne traces its roots to the St. Leodegar monastery, a small 8th century Benedictine cloister on the Reuss River which eventually developed into a modern-day city. For centuries Lucerne has been a crossroad to and from the Gotthard Pass for people and goods. Also, through the years pilgrims have followed St. Jacob’s Way to Santiago through Lucerne. One of Lucerne’s churches, the Franciscan Church, has been under construction since the 13th century with evidence of its history seen in its various architectural styles. The church’s 13th century portions are built in Gothic style, while Renaissance and Baroque styles follow as the walls rise. The church’s wooden carved pulpit dates from the early 15th century, and flags along its upper walls date from the 17th century, when the church doubled as the city hall. Switzerland. get natural. Nationalquai in Lucerne. The Counter Reformation came to Lucerne in the 17th century when Jesuits arrived, influenced by the wealthy Ludwig Pfyffer von Altishofen. In 1666 they built the elaborate Jesuitenkirche on the Reuss River dedicated to Francis Xavier. Architects from Italy and Austria built what many believe to be the most beautiful Baroque church in Switzerland. A short distance from Lucerne is the birthplace of St. Nicholas, Brother Klaus. A path leads from Flüeli to the nearby Ranft Gorge where the 15th century farmer and town counselor secluded himself after sacrificing his career and family for a life of fasting and contemplation. St. Nicholas was instrumental in arbitrating important treaties and political disputes and became Switzerland’s patron saint. 6,995-foot-high Mt. Pilatus and the world’s steepest cogwheel railway, where you can get a 360-degree view of Switzerland. Also nearby is Mt. Rigi, Queen of the Mountains, offering breathtaking views of the Swiss Alps, 13 lakes, and views as far away as Germany and France.